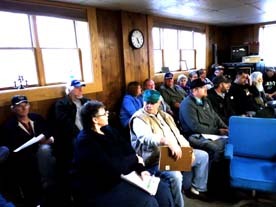 Skip Schulz/For the Gazette Adriana Ruiz-Knack, coordinator for the Ontonagon County Community That Cares program, spoke at the April 8 Ontonagon Village Council meeting. 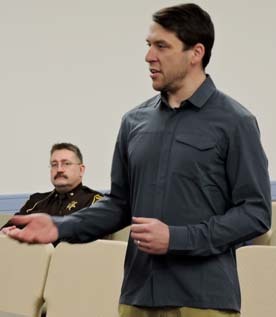 ONTONAGON — Adriana Ruiz-Knack, Ontonagon County Community that Cares (CTC) coordinator, informed the village about what she described as an opioid epidemic in the Upper Peninsula at an April 8 Village Council meeting. The 2-year-old CTC program is funded by North Care Network and Copper Country Mental Health. Of the many pieces of literature Ruiz-Knack handed out to the council and all those in attendance, most focused on health-related issues, including material on what she considers to be an opioid epidemic in the Upper Peninsula. She went into detail in explaining about Narcan, a substance used in an overdose emergency that can revive overdose victims. “Narcan is used to temporarily reverse the effects of opioids,” she said. “There are many reasons for opioid overdose emergencies, but most often they happen accidentally and at home,” she explained. The CTC program will have a training session on the proper and safe use of Narcan will be held May 16, 4-5 p.m. at the Ontonagon Township Library. There is no charge to attend the event. Participants will leave with a Narcan inhaler kit. Registration is required by May 2. Ruiz-Knack reported on recent activities by the CTC, which included hosting a club and doing a student survey in the two county school districts — Ontonagon Area Schools and the Ewen Trout-Creek School District. Ruiz-Knack also told the council the CTC is looking for schools, hospitals, doctors offices and clinics, law enforcement, businesses and anyone to host suicide prevention training workshops. The workshop is co-sponsored by QPR (Question, Persuade, Refer) group, along with the North Care Network and Superior Health Foundation. For more information, individuals can contact Ruiz-Knack at 906-281-6276.